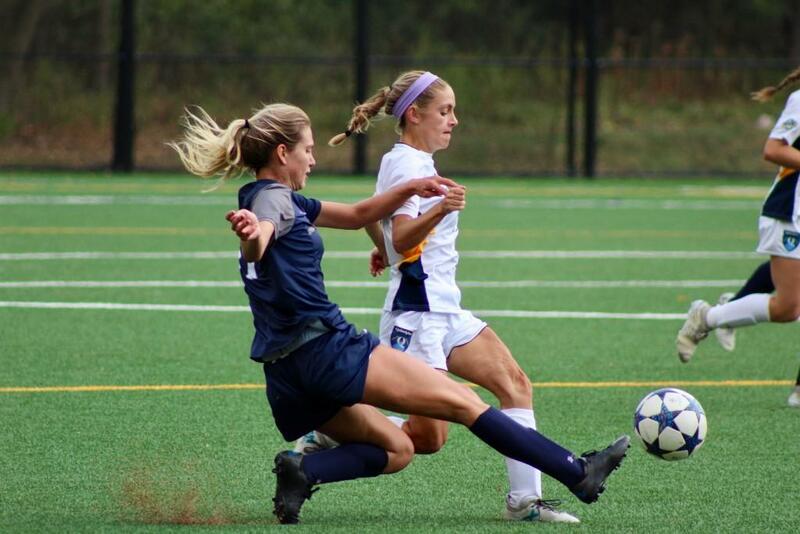 The Quinnipiac Bobcats women’s soccer team outshot the Saint Peter’s Peacocks 13-2, more than doubled St. Peter’s time of possession, and took nine corners compared to St. Peter’s one. With that kind of dominance, it’s not a surprise that there was a shutout on Wednesday afternoon. What is a surprise is the fact that the Bobcats were the team that was shut out – the MAAC-leading Bobcats (6-5-1, 3-1-1 MAAC) fell to the offensively challenged Saint Peter’s Peacocks (2-8, 2-2-0 MAAC) by a score of 1-0, despite Quinnipiac being seemingly in control the entire game. Saint Peter’s only got one chance, and they certainly had to wait – they hardly had the ball for the entire first half. Quinnipiac immediately took control of possession, and they almost got on the board right away. About seven minutes in, Quinnipiac freshman Selena Salas had a wonderful opportunity to put the Bobcats up a goal off a cross into the box, but her header clanked off the post. From that point on, Quinnipiac basically called the Peacocks’ back third their home. Saint Peter’s let the Bobcats go on the prowl for the entire half, with dangerous crosses and through balls every few minutes. Despite this, Peacocks goalie Victoria Scarratt never got much work, only needing to make one save through the first 45 minutes. The second half started the same as the first, with Saint Peter’s fending off a number of Bobcat chances. After an uneventful ten minutes to open the second half, the Peacocks finally got their chance, and Alexandria Couto made the most of it. After a pass deflection, the ball found its way to Couto’s cleats just past midfield, and she was off to the races. The New Jersey-based grad student outran every Bobcat defender en route to the net. Couto’s shot snuck past a diving Olivia Myszewski and nicked the left post before it tucked into the back of the net. It was Couto’s first goal of the season, giving Saint Peter’s just their fifth on the year goal as a whole. After conceding the opening goal, a once-relaxed Bobcats squad tensed up. The passes became a little less crisp, the shots a little more rushed, and the overall play a little choppier. Saint Peter’s, on the other hand, completely parked the bus defensively, clogging the middle of the field to prevent chances. Quinnipiac was completely stifled the rest of the way outside of a few minor chances, and Saint Peter’s held on for the 1-0 win. After the game, Clarke expressed disappointment in his team’s inability to execute the game plan he drew up. “To put it in academic terms, if I’m a professor… I’m giving you the answers, just write it down tomorrow. I’m teaching history, and they came to take a geography test. That’s why they lost,” said Clarke. Quinnipiac’s six-game unbeaten streak was broken in the loss, and they’ll look to rebound on the road against a tough Monmouth team on Saturday. Monmouth has beaten the Bobcats in three straight meetings, including the MAAC championship game two years ago. As for Saint Peter’s, they’ll look to ride this momentum into Poughkeepsie on Saturday when they take on Marist.